In nature there are no synthetic supplements, so dogs and wolves derive their complete nutritional needs naturally, by consuming whole prey animals. 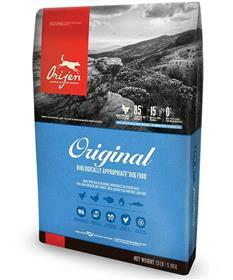 That’s why ORIJEN Original features richly nourishing ratios of meat, organs and cartilage provide a concentrated source of virtually every nutrient your dog needs to thrive, naturally. So you won’t find long lists of synthetic supplements in any of our foods – only zinc is added. Ingredients:Deboned chicken, deboned turkey, yellowtail ﬂounder, whole eggs, whole atlantic mackerel, chicken liver, turkey liver, chicken heart, turkey heart, whole atlantic herring, dehydrated chicken, dehydrated turkey, dehydrated mackerel, dehydrated chicken liver, dehydrated turkey liver, whole green peas, whole navy beans, red lentils, chicken necks, chicken kidney, pinto beans, chickpeas, green lentils, lentil fiber, chicken fat, natural chicken ﬂavor, herring oil, ground chicken bone, chicken cartilage, turkey cartilage, dried kelp, freeze-dried chicken liver, freeze-dried turkey liver, whole pumpkin, whole butternut squash, kale, spinach, mustard greens, collard greens, turnip greens, whole carrots, apples, pears, pumpkin seeds, sunﬂower seeds, zinc proteinate, mixed tocopherols (preservative), chicory root, turmeric, sarsaparilla root, althea root, rosehips, juniper berries, dried lactobacillus acidophilus fermentation product, dried biﬁdobacterium animalis fermentation product, dried lactobacillus casei fermentation product.